Airbnb host Annie W., in a video in which it appears members of the Chicago Police confront her about renting to white tourists, an officer also asks for her ID to cite her for operating a business without a license. The male officer tells Annie, "You have to have a license in the City of Chicago to operate a business." UPDATE [ 11:26am PT 8/24/11 ] Annie has confirmed that she received a citation for not having a business license and is scheduled to appear in court Sept. 22 [ see story ]. This event raises questions about which licenses -- if any -- Chicago residents need to legally host people. From our research, it seems Chicago folks need to consult with the city on how they plan to employ Airbnb's service. 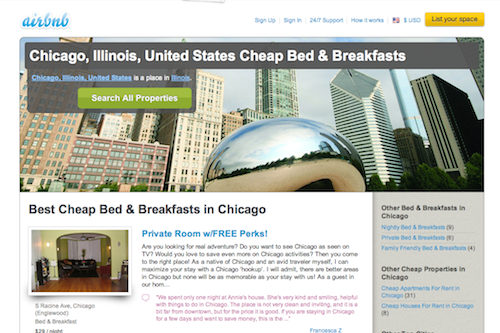 In the City of Chicago, if a resident decides to generate revenue by renting out a room in her residence, she must obtain a single-room occupancy Class II license ($440) from the city, Chicago's Department of Business Affairs & Consumer Protection Business Assistance Center told LAUNCH. Additionally, the building commissioner must inspect the residence annually, and the resident must pay an annual fee of $100 plus $1 for each unit used to accommodate guests. If the host occupies the residence he is renting, he does not appear to be subject to a recent Chicago ordinance aimed at daily and weekly vacation rentals. In effect as of Jan. 1, 2011, the Vacation Rental Ordinance requires those renting out a residence they do not occupy to obtain a license ($500) and collect and pay Chicago's 3.5% hotel tax. Airbnb hosts in Illinois could also be subject to the Illinois Bed and Breakfast Act, which is defined as an owner-occupied residence with 11 or fewer sleeping rooms available for rent. Under this code, hosts are required to obtain a bed and breakfast license with the state ($400). Before they can get the license, the Department of Buildings and Fire must inspect the property and once every two years thereafter. If an Airbnb host is renting out seven or more rooms, the property could be classified as a hotel, which would also require a license from the city ($185 plus an additional $2.20 per unit) and the same types of inspections as a bed and breakfast. Airbnb CEO and co-founder Brian Chesky told the New York Times earlier this summer. "We're not classified as the brokers, we're just the service."